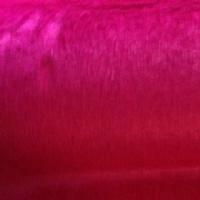 This is a brand new teddy fur in a brilliant magenta color. While it is a teddy bear fur it is slightly longer than some of the others as it is from a different supplier. 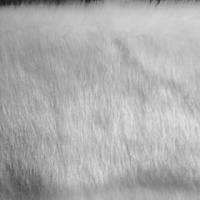 This fur is perfect for any project where you want to make a statemnt-from costumes and mascots to hats, boot toppers, etc. 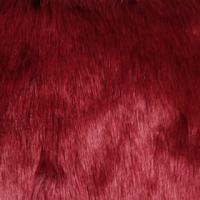 This is a new fur in a very pretty deep red color and with a pile that is called Teddy Bear. While all of these furs are NOT from the same supplier, these furs all have a similar pile, look, and feel. The pile length is "approx" three quarters of an inch and there are plentiful guardhairs. With the holidays approaching this fur would work well for holiday garb, house furnishings, hats, scarves, throws, and the ever popular teddy bear. This is a new fur in a very pretty bright white color and with a pile that is called Teddy Bear. While all of these furs are NOT from the same supplier, these furs all have a similar pile, look, and feel. The pile length is "approx" three quarters of an inch and there are plentiful guardhairs. With the holidays approaching this fur would work well for holiday garb, house furnishings, hats, scarves, throws, and the ever popular teddy bear. Please, let's not forget about Santa himself as this fur would make a beautiful trim for a Santa Suit. On some monitors this may look silver but the fur is bright, optic white. Basically the same fur as the white above but in a soft ivory color-monitors will probably show this color differently so you will need to see a sample before purchasing. 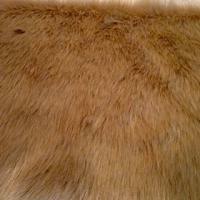 Same as the other furs but in a golden camel color-maybe golden tan, very difficult to pinpoint but it is a very pretty color that is quite neutral so it would work well for many applications. Probably a good idea to see a sample of this one to check if the color will work for your project. 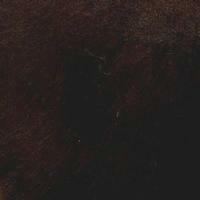 This is a beautiful dark brown fur Teddy bear fur which is the same as the others but in a luxurious dark brown color. PLEASE NOTE- this fur is taking the place of the HF- deluxe plush brown as we cannot get that fur any longer.